After the incredible success of the Voltaic Fuse 4 Watt solar charger on my previous 14-month-long bicycle tour in Europe and Africa, I decided to upgrade to the larger and more powerful 6 Watt solar charger on my travels this year. While the two products are similar in size, the new Voltaic Fuse 6 Watt solar panel produces 50% more electricity by way of its larger surface area and is the perfect size for charging smartphones, GoPro video cameras, tablet computers and other small USB-powered devices. 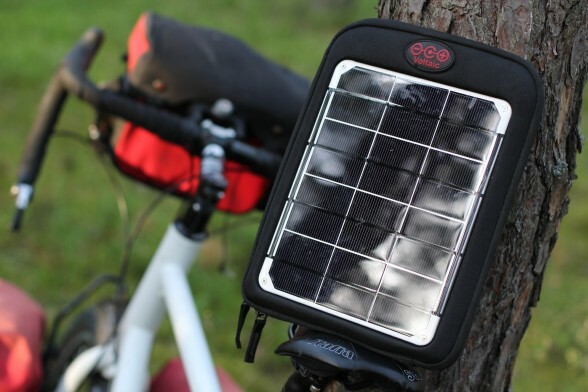 With the universal attachment system that comes standard on all of the Voltaic Fuse products, the Voltaic Fuse 6 Watt solar charger connects in seconds to backpacks, bicycles or wherever solar power is needed. Available in three different colors and priced at only $129 USD, the Voltaic Fuse 6 Watt is the perfect device for charging any USB device – including all Apple, Android and Blackberry smartphones. You can see my 6 Watt charger in use in the image above (it’s resting on top of my bicycle’s saddle) and in the various photos throughout this review. The first and easiest way to use the product is by connecting the small battery that comes with the Fuse to any standard power outlet. Once the battery is fully charged, simply connect the included battery to any USB-powered device that you wish to recharge. The other (and more obvious) way to use the Voltaic Fuse 6 Watt charger is to leave the product out in the sun for several hours. The more sunlight that hits the panel, the faster the internal battery will charge. Once the battery has generated a charge, simply attach your smartphone, video camera, or any other USB-powered device. It’s simply that easy! The company that produces the Fuse 6 Watt panel (Voltaic Systems) says that 3 hours of direct sunlight will charge a smartphone, 6 hours in the sun will charge a small tablet, and 11 hours of sunlight will fully charge a larger tablet computer. My experience with the product tells me that these estimates are pretty darn accurate, but it should be noted that “direct sunlight” is necessary for this type of optimal charge. Cloud-cover of any kind, or placing the solar panel at an improper angle, will increase the amount of time needed for the included internal battery to fully recharge. On a personal note, I’m able to charge my Samsung Galaxy S4 Mini smartphone approximately 2.5 times from the fully-charged Voltaic V39 battery. However, the size of your smartphone battery and/or other electronic device will determine how many charges you can generate from the included battery. To learn more about how the Voltaic Fuse 6 Watt functions, please see my previous review on the smaller Voltaic Fuse 4 Watt or my video review of the larger Voltaic Fuse 10 Watt (both of which operate in exactly the same way). The only real difference between these three products is the size of the panel(s) on the front of each charger and the type of battery included with each device. I’ve been using the Voltaic Fuse 6 Watt Solar Charger on a daily basis for the last 6 months. I’ve been bicycle touring across more than a dozen different countries in Europe and Asia over this time period and the 6 Watt Fuse has been responsible for keeping my smartphone charged for much of this time. There is, however, a major difference between my bicycle tour this year and the one I conducted in 2012/21013 with the smaller 4 Watt charger. This year (2014) I upgraded from a small iPod Touch to a much larger Samsung Galaxy S4 Mini smartphone. As a result of this upgrade, the amount of power needed to keep my smartphone charged (which I use for work, entertainment and navigation while I’m traveling) has increased significantly. My new smartphone has a much bigger battery than my old iPod Touch and I’m using the device more often as well (while at the same time demanding that it perform more complicated tasks). This has resulted in me draining my smartphone’s battery at an unprecedented pace. It didn’t take me long to discovered that even my larger 6 watt solar panel wasn’t going to be enough to keep my smartphone charged for weeks at a time. If I wanted to keep my smartphone charged for long durations, I was either going to need to drastically reduce the amount of time I spent on my smartphone each day (thereby saving the phone’s battery), or I was going to have to figure out a way to charge my batteries at a more rapid pace. What I ended up doing was upgrading to the larger V39 battery (which is an optional upgrade with the Voltaic Fuse 6 Watt charger) and ordered a second V39 as a backup as well. With these two large batteries in my possession, I constantly had one of the batteries charging on the solar panel, while the other battery was working to charge my phone. When the battery running my phone ran out of juice, I’d simply switch the batteries with one another, replacing the battery in the solar panel with the one that was now drained. Because the battery coming from the solar panel had been charging for a day or more at this point, it was usually near full and ready to expel its built-up electricity into my waiting smartphone. This process of swapping the batteries back and forth allowed me to keep my smartphone powered for a week or more (even with moderate daily use). It should be noted, however, that even with two batteries, I’m a pretty heavy smartphone user… and if you’re anything like me, you should know that using a solar charger like the Voltaic Fuse 6 Watt is not the same as having your smartphone constantly plugged into a power outlet. If you want to go for long periods of time using the solar charger as your only electricity-generating device, then you need to be conservative with your electronic use. Even with two of the larger V39 batteries in my possession, I’d eventually run out of electricity and need to find a power outlet in which to charge my various electronics. Would I Recommend The Voltaic Fuse 6 Watt? Solar power is pretty darn incredible… and small solar chargers like the Voltaic Fuse 6 Watt are quickly becoming standard pieces of equipment for hikers, bikers, and modern travelers of various kinds. If you have a smartphone, GoPro video camera, tablet computer or other small electronic device you want to keep powered either at home or out on the road, there are few products out there that could serve you better than the Voltaic Fuse 6 Watt. Currently priced at only $129 USD, the 6 Watt Fuse is the perfect size for hiking and/or cycling. The charger fits perfectly onto the back of a backpack or on the front or rear rack of any type of bike. The 6 watt panel is large enough to produce a significant amount of electricity, but small enough that it doesn’t weigh you down or take up a lot of room. Plus, you can use the included USB battery to keep your electronics charged at all times – whether you’re traveling close to home or on the other side of the planet. The battery alone is worth the price of purchase in my opinion! While the Voltaic Fuse 6 Watt solar charger isn’t large enough to power DSLR camera batteries or laptop computers, it is the perfect device for charging smartphones, tablets and other small USB-powered electronics. I imagine I’ll be using the Voltaic Fuse 6 Watt solar charger on my bicycle tours for the next several years… and I recommend you look into using one for your travels as well. Click here to visit the official Voltaic Systems website, learn more about the 6 Watt Fuse, and purchase a solar phone charger of your very own! This entry was posted in Bicycle Touring Pro Articles, Electronics, Featured Articles, Main Articles, Product & Service Reviews, Products, Tech and tagged 6 watt, backup battery, computer solar charger, smartphone charger, solar charger, solar panel, sun power, tablet solar charger, usb battery, voltaic, voltaic solar charger, voltaic systems. How much do the panels and batteries weigh? I’m not sure of the exact weight… and I’m traveling at the moment, so I don’t have access to a scale. I’ll try and get that information for you at some point in the future… and I’ll add it to this review. Thanks for the review! This looks like an excellent option for our upcoming tour. How waterproof is it? I’m sure in a downpour you’d pack it away, but what about in changeable weather? Do you have to be extra careful to keep it dry or can it withstand some dampness/light showers? The solar panel itself is pretty darn waterproof. You can, for the most part, just leave it outside and it will be okay. The part you have to be careful about is the battery! You don’t want that (or the cable that connects to the battery) to get wet. Otherwise, it is a very weatherproof product… which is great! hey darren, i am looking at either the voltaic 4 watt or the powertraveler solarmonkey, which has also received a number of positive reviews, have you had any experience with this charger? 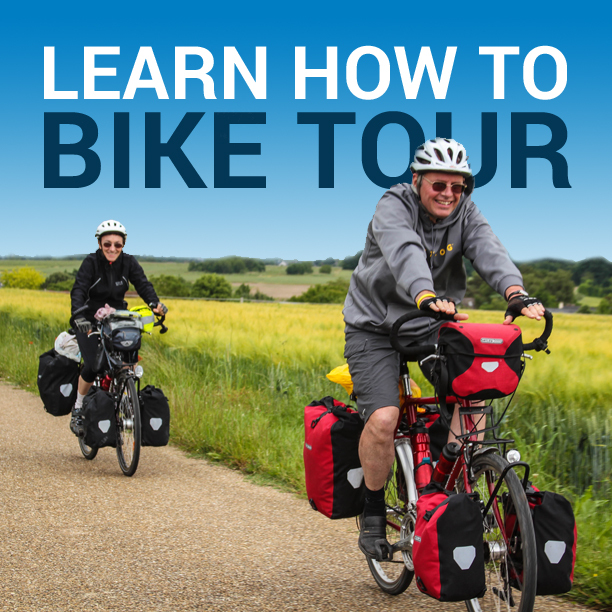 i am not sure if its suited for bike touring. thanks. I don’t have any experience with the solarmonkey… but it looks pretty cheap to me. Maybe that’s why it has so many good reviews? Price??? You COULD use a Hub Dyno… or you could use a solar panel AND a Hub Dyno. Most people don’t want the expense and/or hassle of a Hub Dyno though, and some people don’t like the extra resistance that a Hub Dyno creates… so that’s when solar power is a good option. Hi Darren, Thought I would interject a comment here, I recently purchased a Voltaic 6W after watching your review of this product. I have had nothing but problems with the product for the last six months. The battery would not charge. I contacted Voltaic, and I have to say, I have been more than impressed with their service!. They have been the most helpful, polite customer service oriented folks to deal with. I would like to Thank You for introducing me to such a wonderful product and such a wonderful company to deal with. Needless to say, my Voltaic 6W is working like a charm now. Wow, I’m so sorry that you had such an issue. What was the problem exactly? Just the battery? You got a faulty battery? Great review! Seems solar panels are improving every year – as all technology is. Regarding your comment on dynamo hubs – I’m not sure even the most discerning rider would notice the drag a contemporary hub like those by Son, Shutter Precision or Shimano creates – I think it creates an additional load of 3%, which is neglible on a loaded touring bike. Anyway that’s my two cents! Might be worth checking them out for a future review. It might improve your charging efficiency if you can charge your item directly from the photo cell array. Every time you do a conversion you lose some power since no conversion is 100% efficient. For example, let assume you are getting 90% efficiency which would be exceptionally high. You charge battery #1 and have 90% efficiency. You then discharge battery #1 to create electricity at 90% and use that power to charge a 2nd battery at 90%. Your overall efficiency is .9 x .9 x.9 or about 72%. Doing it directly would give you 90% which is over 25% better. I understand some of the problems with a dyno hub but I always thought it would be good if you could use it when you would normally be braking. Instead of throwing away all that energy as heat, friction on the brakes, you recover some of it as electricity. Lower wear on the brake pads is an added bonus.